Located in Pineville, NC Peppermint Forest Christmas Shop offers the area's largest selection of true-to-life Christmas trees, fireplace scenes, mantles, and vignettes. Peppermint Forest is one of the South's Largest Christmas Shops since 1980! Peppermint Forest was founded over 30 years ago in Charlotte, NC and has continued to grow ever since. We offer the area's largest selection of true-to-life Christmas trees and a showroom full of over 50 beautifully decorated Christmas trees, fireplace scenes, mantles, and vignettes. It all starts with a Christmas tree, but decorating the rest of your spaces is what really expresses your personal style. Santas, snowmen, and angels. Nativities, tabletop pieces, and candles. Stockings, tree toppers, and bead garlands. Each piece makes a statement and our unmatched selection lets you say whatever you're feeling this holiday season! You won't find a larger selection of true-to-life Christmas trees anywhere else in the Carolinas! Our showroom features a "tree forest" of over 100 undecorated Christmas trees of all shapes, sizes, heights, shapes, colors and styles. Sizes range from 8 inches up to 12 feet tall and are available in full, slim, trim, downswept profiles, just to name a few. Lighting options include Peppermint Forest's exclusive WonderLit Trees, Pre-Lit, and Unlit. You're sure to find that ideal Christmas tree that fits your personal taste and space perfectly! Ornaments take many shapes. At Peppermint Forest Christmas Shop, they take thousands of shapes. Glittery gold snowflakes, clear glass balls, hand-painted purple drops, chiseled wood santas, birds that seem to come to life, polished silver angels, pink plastic flip-flops, stamped tin holiday greetings, white ceramic snowmen...the list goes on forever. Stop by and pick your favorite (or favorites...one is not enough). Ornaments makes a great personalized gift and a collection of ornaments can dramatically change the look of your Christmas tree this year. Ornaments aren't just for trees. Place them in a hurricane as a centerpiece or give some extra personality to your wreaths and garland. Hang them from a doorway or a chandelier. Our showroom is an incredible place to get inspired to create your own special arrangement for 2013! Christmas is often a time of year that fun traditions hold a special place in your family and friends' hearts. 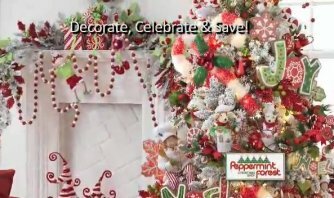 Whether you are continuing a tradition that has been passed down for generations or you are starting a new one that will be embraced for generations to come, Peppermint Forest Christmas Shop features many collectibles to help you do just that.